Retired nurse Jean Reno navigates complex recurrent breast cancer thru optimism, humor, realism, and service to others. I have been one of Jean Reno’s oncology nurses since 2015 at University of South Alabama Mitchell Cancer Institute Kilborn Clinic in Fairhope, Alabama. She’s one of my favorite patients. In addition to being her nurse, I am also a fellow patient at Mitchell, in treatment for recurrent endometrial cancer. Jean and I both receive chemotherapy there every 3 weeks. We share the same great office staff and the same superb medical oncologist, Dr. Daniel Cameron. Jean’s resilience inspires me to feel hopeful through my own recurrent cancer journey. She models the kind of optimism I would like to inspire in my own patients. Her breast cancer journey enters its 5th year this February. Through it all, she has endured years of chemotherapy, surgeries, and personal hardships including the loss of her soulmate and husband, Ron, in 2002. They were married for more than 28 years. My husband Ben and I with Jean (right) as I rang the bell completing 3 months of chemotherapy. Jean declares that our office staff lightens her load and the feeling is indeed mutual. She delights in making all of us there happy. Though her appetite isn’t always great, she relishes in cooking up and sharing platefuls of her scrumptious homemade goodies with us and with fellow patients during her weekly office volunteer day. 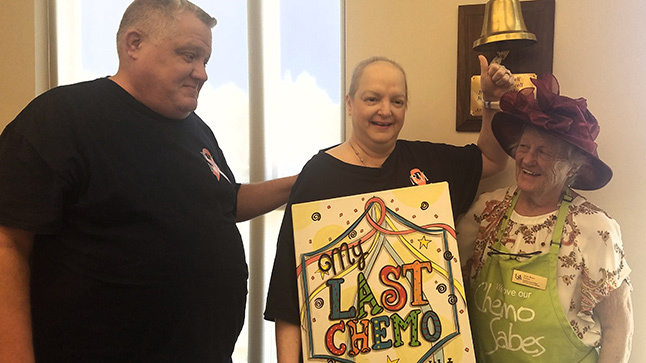 My husband Ben and I were so very honored to have Jean by our side last October, cheering me on, as I rang the office chemo bell signifying my completing 5 months of challenging chemo prior to starting maintenance phase chemo. Approaching the 2019 New Year, I wondered how I might continuously renew hope in my future intertwined with recurrent cancer. My answer is faith in God, family, and friends. Since 2015, Jean Reno has been teaching me by her example as a true “overcomer” that the gift of illness is living in the moment and seizing the day. Mundane events take on a sparkle. Things I love, and should love, become clearer and brighter. This is transcendence with the past, present, and the future experienced together in moments where I can see flickers of eternity through Jean’s positive persona and gifts of service to others. God Bless you, Jean, and thank you so much for sharing your gifts! You’re helping me to grow so much in my dual citizenship role as an oncology nurse and fellow cancer survivor. My journey through chemotherapy this second time around would have been a whole lot harder without Jean’s empathy for me as a fellow patient and her up-close, personal knowledge of some commonalities we shared during treatment. As an oncology clinic nurse, I impart to my fellow patients the life lessons I’ve learned from Jean over the years. Lessons of hers that I try to give to my patients, especially to those who are struggling in the moment, include her persona to overcome adversity, her rah-rah spirit, determination, collegiality, and her attitude of resiliency, in that she does not allow circumstances to intimidate her greatly. We became oncology nurses to skillfully guide our patients and their caregivers through their own cancer journey. It’s not about us; it’s about them. Isn’t that how it should always be? As nurses we’re excellent caregivers. Let us think about that care. The work always gets done somehow. Perhaps we must first redefine the work. The most important activity, the most beneficial for everyone involved is to truly be there for someone. Let us give the greatest gift of all---the gift of ourselves. 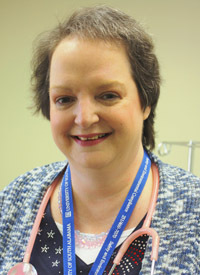 Survivor profile: Jean Reno faced breast cancer with optimism, humorMitchell Cancer Center online article. usahealthsystem.com/body-mitchellcancerinstitute.cfm?id=5152&action=detail&ref=246. Posted August 28, 2018. Accessed October 1, 2018. Hawaii recently allowed medical aid in dying for patients with terminal diseases, and other states may soon follow suit. I was chosen by ONS to serve as one of its first-time oncology nurse advocates for the 2017 ONS Capitol Hill Days conference held Sept. 6-7 in Washington, DC., representing ONS and my Northwest Florida ONS Chapter. I wanted the world to recognize my chemo nurse, Wanda Greeley's strong commitment to me and all her other patients with cancer.